Our Fairways for Freedom® golf journeys are truly unique experiences, and each year we conduct three different types of trips — Red, White and Blue Trips. Red Trips are retreats for veterans only, usually in the U.S., with an emphasis on therapeutic sessions, relaxing activities such as hiking, fly fishing and horseback riding, and mindfulness and yoga. 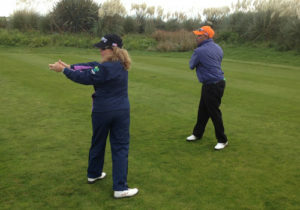 They also include lots of golf practice time, golf instruction and play on easier courses. White Trips are international trips, with travel to Ireland, Scotland and other beautiful international locations. There is an emphasis on therapeutic sessions and mindfulness and yoga, plus golf practice time, golf instruction and two optional golf days. We stay in one hotel the entire trip. Blue Trips are more demanding all around, with more intense itineraries and therapeutic sessions, including mindfulness and yoga, and golf almost every day on some of the world’s most spectacular and demanding golf courses. We stay at two or more hotels for the week. 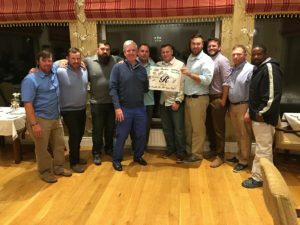 On our White and Blue Trips, specially selected combat-injured Veterans are sponsored financially and joined on the trip by an Ambassador. Our Ambassadors are people who want to give something back to our men and women in uniform who have sacrificed so much. Together, they play some of the greatest golf courses in the world, create everlasting memories, develop rock-solid friendships and even more than that, inspire each other to continue to push forward. We have two international trips scheduled for September 2019. Each one includes golf on six spectacular courses. One trip is to Nova Scotia (Blue Trip). A second trip is to Northwest Ireland (White Trip) and staying in one incredible location. Both are now open for Ambassador bookings with limited Ambassador availability. Each trip consists of approximately six Ambassadors, 8-10 combat-injured veterans and 2-3 staff. If you would like to become an Ambassador and support these outstanding men and women, please visit our Support our Veterans page. Send us an email on the Contact page, and one of our Fairways for Freedom® dedicated staff will get back to you within 24 hours.